Includes day time running chrome LED fog lights! LED (white) daytime running lights can be also use as fog lights which will enhance visibility during night time. Replace your fogged up and damaged 96-98 Honda Civic OEM headlights with our new stylish euro style headlights. These lights are the perfect way to give your car a customized and sleek look without attracting too much attention. 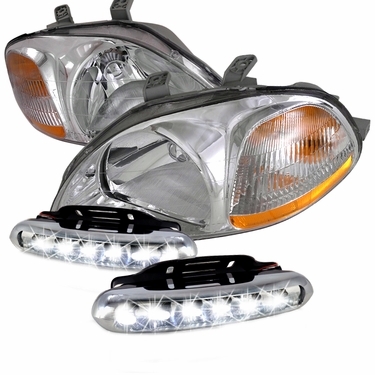 Made to be a direct replacement for your Civic OEM headlights, easy to install and no modification needed.